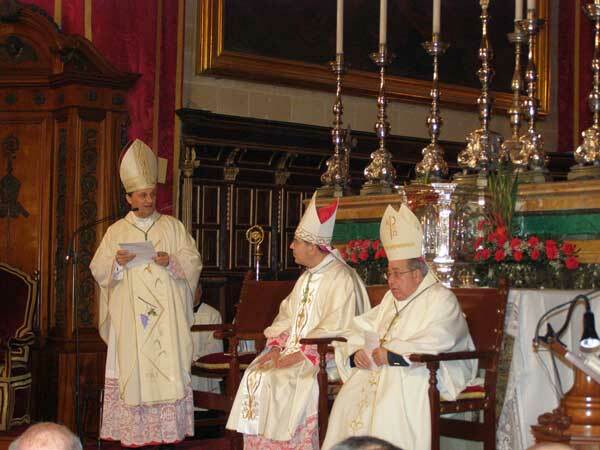 Published on November 25, 2008	in Apostolic Nuncio - Communications. It is with great joy in the Lord that I greet the Church in Gozo. I greet you, dear Bishop Mario, dear priests and religious and all the lay faithful of this portion of God’s flock in this dear Island, as your diocese embarks on an event and an experience of great pastoral importance – the Diocesan Mission, or Missjoni Djoċesana. During this solemn celebration of the feast of Christ the King, it is indeed very fitting to reflect on our responsibility as committed Christians, and how this responsibility is intimately connected to our celebration of the Eucharist. Published on April 22, 2008	in Apostolic Nuncio - Communications. 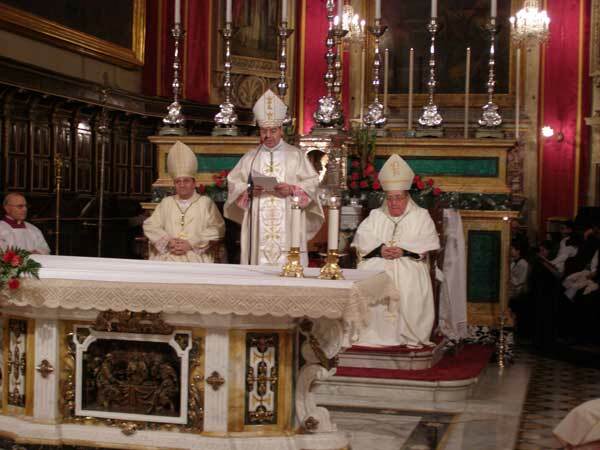 Last Sunday, 20th April 2008, the Apostolic Nuncio to Malta,HE Mgr Tommaso Caputo celebrated mass at Ta’ Pinu Sanctuary to commemorate the third anniversary of the election of Pope Benedict XVI. The Nuncio was accompanied by HE Mgr Mario Grech, bishop of Gozo. Published on January 15, 2008	in Apostolic Nuncio - Communications. 1. I am deeply grateful to His Lordship, Bishop Mario Grech, for his fraternal welcome and for his kind invitation to lead this Eucharistic Celebration in this beautiful cathedral of Gozo, at the start of my mission as Papal Representative in Malta. I offer my very warm greetings to all of you, beloved faithful, as well as to Authorities of State here present, to H.E. Mons. 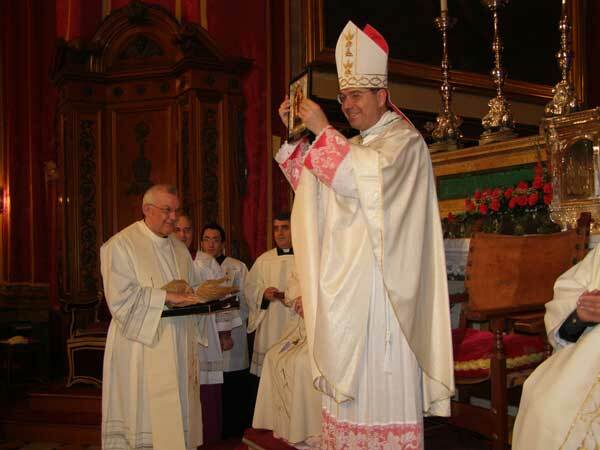 Nikol Cauchi, Bishop emeritus, to the Members of the Cathedral Chapter, the priests, religious men and women, and the representatives of the various lay institutes and associations. We celebrate with joy this Holy Eucharist on the First Vespers of the second Sunday of the Ordinary time. Before reflecting on the liturgy of today and before briefly considering the nature of the Papal Representative’s mission, I have the pleasure to convey to you the greetings and the blessing of His Holiness Pope Benedict XVI. When appointing me Apostolic Nuncio to Malta on September 3rd last, the Supreme Pontiff wrote this to me: “Beloved son, as you take up this onerous office, I exhort you with the words of the Apostle Saint Paul, whom, in times past, the inhabitants of Malta welcomed with uncommon kindness (cfr. Acts 28, 2), and I would urge you to bear them constantly in mind: ‘I do not mean to imply that we lord it over your faith; rather, we are workers with you for your joy, because you stand firm in the faith”. These words of the Apostle, our father Saint Paul, echoed deeply in my heart, in these first weeks of my stay in Malta. I feel really welcomed here with “particular affection” by the Bishops, the Authorities, the clergy, the religious, the lay associations, and the entire people of Malta. It has always been a matter of no small encouragement and consolation to me, in my previous missions in Africa (Rwanda), in Asia (Philippines), and in Latin America (Venezuela), to encounter zealous Maltese missionaries: with some of them I struck up a warm and brotherly friendship. These missionaries reflected the vitality of Christian life in this God-graced country. Saint George Preca, with the Blessed Adeodata Pisani and Ignatius Falzon, scions of this noble nation, are today exemplars of Christian life for the whole Church. Yes, indeed, the Holy Father, in committing St.Paul’s words to me for my guidance, has supplied me with a unique program of life and work: “I do not mean to imply that we lord it over your faith; rather, we are workers with you for your joy, because you stand firm in the faith” (2 Cor 1, 24). My sole desire is to be the co-worker of your joy: the joy that means discovering and re-discovering the presence of Jesus in our lives and in the midst of Malta’s Christian people, the joy that means emulating one another in the exercise of communion, in love, in unity, on the model of the Most Blessed Trinity. 2. The office of the Papal Representative is in direct dependence on that of the Pope, the Successor of the Apostle Peter, “perpetual and visible source and foundation of the unity both of the bishops and of the whole company of the faithful”, as the Vatican Council II teaches us in the Dogmatic Constitution Lumen Gentium (LG 23). At the Last Supper our Lord prayed for the unity of His Church, beseeching the Father that all His disciples be one: “ut omnes unum sint” (Jn 17,22). Now, if it is the duty of each of the faithful to strive personally to live and maintain such a unity, how much more is this the duty of him, whom the Lord has placed as visible head of His Church, the Pope? The chief function of the Pope in the Church is that of “maintaining the Episcopal College one and undivided”, as the Vatican Council II again teaches us (LG 18). Papal Representatives, the Apostolic Nuncios, who today operate in 178 countries, are instruments of collaboration for the sake of that unity for which the Lord prayed. They are intermediaries, by means of whom the Roman Pontiff, who “presides over the whole assembly of charity” (St.Ignatius of Antioch, To the Romans, Preface), makes himself present in a stable manner “among the local Churches and among States in all parts of the world. Through his Representatives, residing in the various Nations, the Supreme Pontiff participates in the very life of his spiritual children and, by becoming, in a certain way, part and parcel of it, is in a position to know, quickly and surely, their necessities and aspirations” (cfr Sollicitudo Omnium Ecclesiarum). Thus, the principal task of the Papal Representative is that of rendering firmer and more effective the bonds of unity between the Apostolic See and the local Churches (CIC can, 364). It is also the task of the Papal Representative to promote and sustain good relations between the Holy See and the Authorities of State, as well as to treat questions concerning relations between Church and State, with the advice and counsel of the local Bishops (CIC can. 365). The Papal Representative is, in this way, at the service of communion within the Church, an instrument of communion in the service of the Petrine charism. 3. In today’s Gospel (Jn 1, 29-34) we meet Jesus at the beginning of his three years of public life, after spending thirty years of a hidden life in Nazareth. We are at the start of Jesus’ ministry, by the banks of the river Jordan. John the Baptist saw Jesus coming from a far and identified him: “Behold the Lamb of God who takes away the sin of the world.” A title (Lamb of God) and a phrase (who takes away the sin of the world) lead us directly to the mystery of the heart of Christ. Jesus is presented to us with the meekness of the Lamb which, (as in the ancient sacrifices of expiation) takes upon himself the sin of the world: as the one who with the redemptive force of his sacrifice uproots and eradicates the sin of the world. So, even at the very beginning of Jesus’ public life, there is the annunciation of his death and the grace of the redemption. John the Baptist introduces us to an ineffable experience which accompanies Jesus’ mission: the indissoluble union between Jesus and the Holy Spirit: “I have seen the Spirit descend as if a dove from heaven and rest upon him”. In today’s Gospel, John the Baptist does not only stop to admire God’s mystery, but wants to witness to it: “And I have seen it and render witness that this is the Son of God.” Our faith in Jesus rests upon this vision and this witness, a faith which we cannot modify according to our whim or according to the taste of the times. He is the Son of God! During the moment when we might feel defeated, at the mercy of a society without ideas or ideals, the faith, a purified and regenerated faith in Christ, must rise in our world as a light and guide of existence. But in order that there is this light there is need of bishops, priests, male and female religious, Christians who are witnesses to the mystery contemplated and who speak and act with the conviction of John the Baptist: “I have seen and rendered witness that this is the Son of God”. That is, I have seen, I believe in Jesus, I bear Him testimony through a coherent life. John the Baptist is today our master of the spiritual life. His journey of faith toward Jesus becomes an example to imitate. In today’s Gospel he twice says “I did not know Him”. Not that he did not know Jesus at all; they were relatives, their mothers were cousins. But what does “I did not know Him” mean? John the Baptist knew about Jesus’ personal physical characteristics, His birthplace, and His origins. But who He really might have been, John understood this at the moment of the baptism in the river Jordan, in the revelation, in the “manifestation”: “I saw the Holy Spirit… He is the Son of God”. John the Baptist had been attentive, available, and open. This experience of John, from a “non knowing” to a complete faith in Jesus, is a great comfort to us all, who can have doubts, be perplexed, disoriented. Even we must feel that we are journeying, growing in faith. ▪ Let us pray therefore during this Holy Mass that the faith of all the Christians of Gozo, of the Bishop, his priests, of female and male religious, of all of us, will grow more, under the action of the Holy Spirit, the Sanctifier, as we listen and adhere faithfully to His voice. Let us pray so that our life will translate itself into a coherence of life, in commitments and works of fraternal charity, so that, as we read in the second reading (1 Cor.) “We are called to become saints together all those who in everyplace invoke the name of our Lord Jesus Christ”. Through the intercession of St. John the Baptist let us also entrust the Holy Father Pope Benedict XVI and the entire Episcopal College. And I ask you to entrust also my own ministry as Papal Representative among you. Pray for me that I may be faithfully responsive to the Love of God, so that His plan for me may fully be realized. Amen.